You might have seen the ads of Shadow.tech for their cloud based high-end gaming PC offer, right? You can rent a PC with a Xeon processor, 12GB RAM and a graphics card like a Geforce GTX 1080. If you go for the 12 months plan, it’s only USD 34.95 or 29.95 Euro. If you want to try it and use my code STEFLS6U, you can save 10 Euro in your first month. 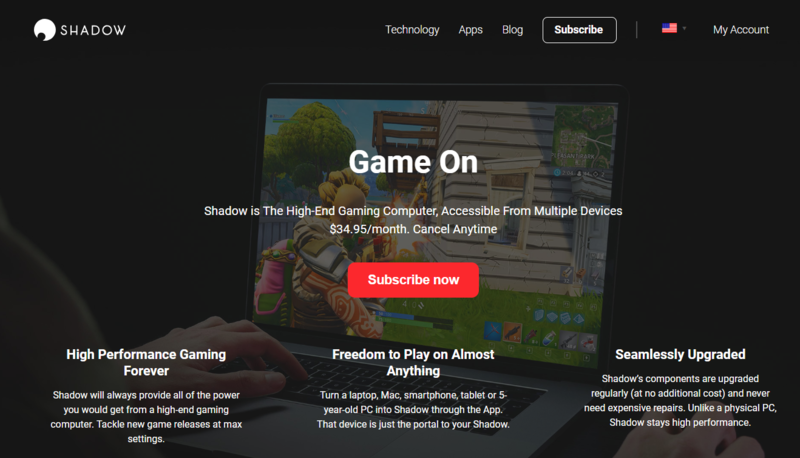 Click here to go to shadow.tech and get your discount. I’m not a gamer, but as you might know, I like render stuff. So I tried this for Daz Studio with the Nvidia Iray renderer and with the Reality plugin and Luxrender. This blog post is about Nvidia Iray on the Shadow PC. It uses the GPU and therefore a powerful graphics cards with many CUDA cores is perfect for it. My Shadow has a Nvidia Quattro P5000 and has a lot of graphics power. After you have registered an account and chosen your plan, you can download their client for your platform. I tested it on Mac OS and Windows 10 and both work very well. The client is some kind of special remote desktop with a much better streaming of video and less latency of the keyboard and mouse. Remember, they offer it for gamers and so it works perfectly for DAZ Studio. You can download and install DAZ Studio directly from your Shadow, the internet connection is very fast. Unfortunately you cannot directly connect to your Shadow from your local PC to exchange files. If you want to get your DAZ Studio library to the Shadow it might be the easiest way to use a cloud storage and sync service. I used pCloud which is very fast and stable. Once you’ve copied and synced all your stuff to your Shadow, you can start DAZ Studio and create or load your scene. It’s awesome! I can use the interactive Nvidia Iray drawstyle when trying different clothes or body shapes and I can still work smoothly. Rendering a complete picture is so much faster and it makes working with DAZ Studio and Nvidia Iray really a pleasure! This picture has been rendered in less than 45 minutes. By the way… she’s an elf with the name Berina I’m currently working on. Connecting directly to the Shadow to exchange files would really be great. The workaround with cloud sync is ok, but a file share or something like this would be better. Up to now I couldn’t get my 3D connexion mouse to work with the Shadow. Their beta client has a option to use USB over IP and the Shadow does also show the 3D mouse, but it doesn’t work yet. Well, as the feature USB over IP is still beta, it might work in a later release. I managed to get my 3D connexion mouse working and it makes navigation in the scene so much easier. If you want to give it try, go to shadow.tech and use my code STEFLS6U to get your discount. Do you have questions? Write them in the comments and I will answer then!